Objective: Total knee arthroplasty (TKA) is a common surgical procedure used to treat patients with high-grade varus knee osteoarthritis (OA). However, a change in alignment of the knee may cause radiographic problems in the ankle joint and secondary clinical complaints. The purpose of this study was to investigate radiographic changes in coronal alignment of the ankle joint immediately after primary TKA for varus knee OA. 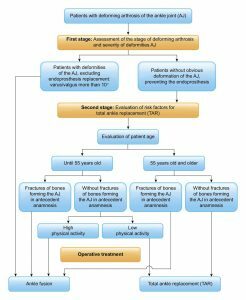 Methods: In this study, 125 cases in 91 patients (30 case in 19 men, 95 cases in 72 women; mean age 74.2 years) who underwent TKA between 2009 and 2016 were enrolled. 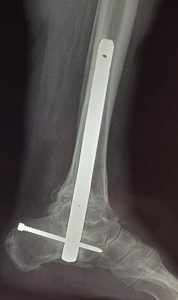 Weight-bearing anterior-posterior (AP) radiographs of the lower extremity were taken preoperatively and 2 weeks after surgery. The hip-knee-ankle (HKA) angle, tibial plafond inclination (TPI), talar inclination (TI), and talar tilt (TT) were measured. Results: Mean HKA, TPI, TI, and TT had decreased significantly by 2 weeks after surgery. Pearson correlation coefficient analysis showed that the change in HKA was correlated with changes in TPI and TI, the change in TPI was correlated with the changes in TI and TT, and the change in TI was correlated with the change in TT. Postoperative TT was significantly greater in the group with a preoperative HKA above 16° than in the group with a preoperative HKA below 16°. Postoperative TT was greater in the group with a postoperative HKA above 1.3° than in the group with a postoperative HKA below 1.3°. Conclusion: Immediately after TKA for varus knee OA, correction of knee alignment had an impact on alignment of the ankle joint radiographically. Care is needed with regard to coronal alignment of the ankle joint when performing TKA in patients with an HKA above 16° and the target is HKA less than 1.3° during TKA. Osteoarthritis (OA) of the knee is an orthopedic problem worldwide, and affects a large proportion of the elderly population [1, 2]. OA causes varus deformation in the knee joint, resulting in abnormal alignment in the coronal plane. Currently, total knee arthroplasty (TKA) is the procedure most commonly performed for varus knee OA [3-5] and has proven to be very successful in restoring the alignment of the lower extremities. In TKA, it is desirable to have a line between the center of the femoral head and the center of the ankle through the center of the knee. Although the focus of TKA is on the knee joint [6-10], acute correction in the alignment of the knee joint during TKA can cause compensatory changes in neighboring joints, including the orientation of the ankle. It has also been reported that foot and ankle problems might be a source of pain after TKA as a result of changes in alignment of the legs [11-14]. However, there is limited data on the impact of change in the mechanical axis of the lower extremity immediately after TKA. 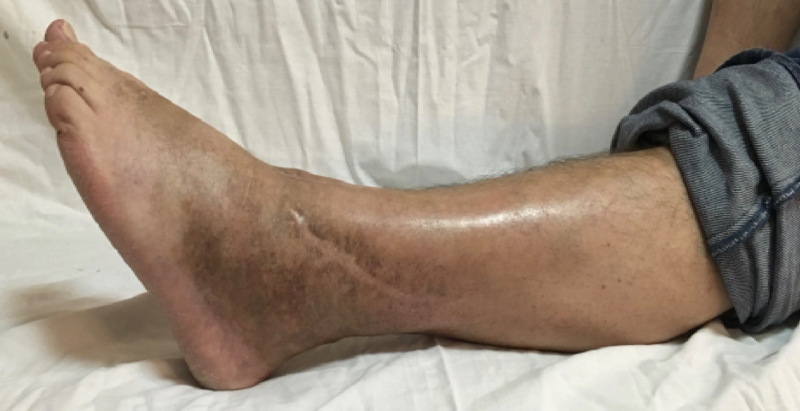 The purpose of this study was to investigate radiographic changes in coronal alignment of the ankle joint immediately after TKA rather than during longer-term follow-up. Our hypothesis was that TKA for severe varus knee OA has an immediate rather than a delayed effect on coronal ankle joint alignment. This retrospective study was approved by the Institutional Review Board at Tokushima University Hospital. The patients involved provided informed consent for this report. A total of 125 cases in 91 patients (30 cases in 19 men, 95 cases in 72 women) who underwent primary TKA for symptomatic varus knee OA between 2009 and 2016 were enrolled. The patients had a mean age of 74.2 ± 7.7 years and a mean body mass index of 29.2 ± 3.8 kg/m². Patients with a history or signs of previous ankle trauma or surgery, congenital or developmental deformities, or inflammatory arthritis were excluded. 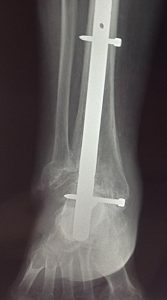 To evaluate the coronal alignment of the ankle joint on weight-bearing AP radiographs of the lower extremity, the following parameters were measured preoperatively and 2 weeks after surgery: (1) hip-knee-ankle (HKA) angle, the angle between a line from the center of the femoral head to the center of the knee (mechanical axis of the femur) and a line from the center of the knee to the center of the ankle (mechanical axis of the tibia); (2) tibial plafond inclination (TPI), the angle between the tangent of the tibial plafond and the horizontal line; (3) talar inclination (TI), the angle between the tangent of the talar dome and the horizontal line; (4) talar tilt (TT), the angle between the tibial plafond and the talar dome, which was calculated from the difference between the TI and TPI (Figure 1A, 1B). A positive HKA angle indicated varus knee alignment and a negative angle indicated valgus knee alignment. Positive TPI and TI values, which indicate medial inclination, were used to define an angle opening to the medial aspect. Therefore, a medial angle was considered to indicate positive varus. A positive TT value, which indicated varus alignment of the ankle joint, was used to define an angle opening to the lateral aspect. Therefore, a lateral angle was considered to indicate positive varus. Measurements were made on three occasions by an independent orthopedic surgeon who was blinded to the patient’s clinical information and the purpose of the study. The average of the three measurements was calculated. 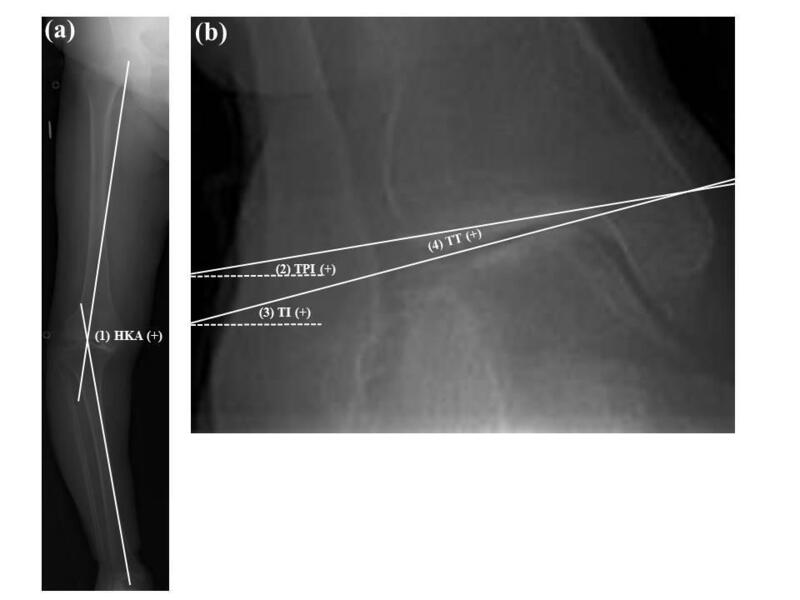 Figure 1 Radiographic parameters for evaluation of coronal alignment of the knee and ankle joint on standing whole-leg anteroposterior radiographs. A. (1) The hip-knee-ankle (HKA) angle is formed by a line from the center of the femoral head to the center of the knee and a line from the center of the knee to the center of the ankle. A positive angle indicates varus knee alignment. B. (2) The tibial plafond inclination is defined as the angle between the tangent of the tibial plafond line and the horizontal line. A positive value indicates medial inclination. (3) Talar inclination is defined as between the tangent of the upper talus and the horizontal line. A positive value indicates medial inclination. (4) Talar tilt is defined as the angle between the tibial plafond inclination and the talar inclination. A positive value indicates varus alignment of the ankle joint. The dashed line indicates the ground. All statistical analysis was performed using SPSS software ver. 24.0 (SPSS Inc, Chicago, IL). All data are reported as the mean ± standard deviation. Paired t-tests were used to evaluate changes in values between before and after surgery. The radiologic indices of the two groups were statistically analyzed using the independent t-test. Pearson correlation coefficients were used to determine the relationship between changes in HKA, TPI, TI, and TT after TKA. Continuous variables were compared between the two groups using the Mann-Whitney U test. A p-value < 0.05 was considered to be statistically significant. Preoperatively, 11 of 125 cases (8.8%) showed TPI (+), TI (+), and TT (-), indicating negative valgus TT (medial tilt), and 114 of 125 (91.2%) showed TPI (+), TI (+), and TT (+), indicating positive varus TT (lateral tilt). The orientation of the ankle joint became more parallel with the ground after TKA. Postoperatively, 17 of 125 cases (13.6%) showed a TPI (+), TI (+), and TT (-) pattern, 72 of 125 (57.6%) showed a TPI (+), TI (+), and TT (+) pattern, 7 of 125 (5.6%) showed a TPI 0, TI 0, and TT 0 pattern, 12 of 125 (9.6%) showed a TPI (-), TI (-), and TT (+) pattern, and 17 of 125 (13.6%) showed a TPI (-), TI (-), and TT (-) pattern (Table 1). Table 1 Preoperative and postoperative TPI, TI, and TT. The mean HKA decreased from 15.4° ± 5.9° preoperatively to 1.2° ± 2.1° at 2 weeks postoperatively. The medial inclination of the distal tibial joint surface and the upper talus decreased after TKA. The mean TPI decreased from 11.0° ± 5.0° preoperatively to 2.8° ± 4.5° after postoperatively, and the mean TI and mean TT decreased from 13.4° ± 5.8° to 3.6° ± 5.3° and from 2.2° ± 2.4° to 0.8° ± 1.8°, respectively. HKA, TPI, TI, and TT decreased significantly between preoperatively and 2 weeks postoperatively (p < 0.05 for all four parameters; Table 2). Pearson correlation coefficient analysis showed that the change in HKA was correlated with the change in TPI (r = 0.500, p < 0.05) and TI (r = 0.480, p < 0.05), the change in TPI was correlated with the changes in TI (r = 0.870, p < 0.05) and TT (r = 0.260, p < 0.05), and the change in TI was correlated with the change in TT (r = 0.285, p < 0.05; Table 3). Table 2 Corrective changes in HKA, TPI, TI, and TT. *Statistically significant difference between the two groups. Table 3 Pearson correlation coefficient analysis of changes in HKA, TPI, TI, and TT. Pearson correlation coefficient analysis also showed that the change in HKA was not correlated with the change in TT (r = 0.065, p = 0.478). However, the mean postoperative TT was significantly greater in the group with a preoperative HKA above 16° (HKA 20.4° ± 4.6°) than in the group with a preoperative HKA below 16° (HKA 11.2° ± 2.6°; TT 1.3° ± 1.9° and 0.7° ± 1.6°, respectively; p < 0.05; Table 4). The postoperative TT was greater in the group with a postoperative HKA above 1.3° (mean HKA 3.1° ± 1.3°) than in the group with a postoperative HKA below 1.3° (HKA -0.4° ± 1.3°; TT 1.4° ± 1.7° and 0.6° ±1.7°, respectively; p < 0.05; Table 5). *A statistically significant difference between the two groups. Table 4 Correlation between postoperative TT and preoperative HKA in the group with HKA ≥ 16° and the group with HKA < 16°. *A statistically significant difference between the two groups (*P < 0.005). Table 5 Correlation between postoperative TT and postoperative HKA in the group with HKA ≥ 1.3° and the group with HKA < 1.3°. Preoperatively, the ankle joint orientation line (TPI and TI) in all cases in this study was varus with respect to the ground line. Postoperatively, the ankle joint orientation line was close to parallel with the ground line and the TT was decreased. The change in alignment of the knee joint had a significant effect on alignment of the ankle immediately after TKA, rather than having a delayed effect seen only during long-term follow-up. However, in many cases, the medial inclination of TPI and TI and varus TT remained 2 weeks after surgery. In our study, postoperative TT was significantly greater in the group of cases with a preoperative HKA above 16° (n = 55, 44.0%) than in the group with a preoperative HKA below 16° (n = 70, 56.0%). This finding indicates that the group with a preoperative HKA above 16° was significantly more likely to continue to have a positive TT (varus ankle joint) even after TKA. The postoperative TT was greater in the group with a postoperative HKA above 1.3° (n = 57, 45.6%) than in the group with a postoperative HKA below 1.3° (n = 68, 54.4%). Our study showed that the group with postoperative HKA above 1.3° was also significantly more likely to continue to have a positive TT (varus ankle joint) even after TKA. Therefore, we recommend a cautious approach to coronal ankle joint alignment when performing TKA for severe varus knee OA, especially when the HKA is above 16°. Gursu et al. reported that leaving residual varus in the knee could be considered in order to prevent malalignment of the ankle joint , but we suggest aiming for an HKA below 1.3° during TKA. An important strength of this study is its large sample size when compared with other studies. It is very difficult to retain such a sample size for the duration of a study. The outcomes evaluated in our study provide important information regarding alignment of the ankle joint immediately after TKA. To our knowledge, this is the first report to demonstrate that TKA for severe varus OA knee has an effect on coronal alignment of the ankle joint immediately rather than gradually. One limitation of this study was that subtalar joint mobility was not investigated and radiologic assessment of hindfoot alignment was not performed. Alignment of the hindfoot changes when alignment of the knee joint changes [15, 16]. Most of the compensation for angular deformity of the knee joint occurs in the subtalar joint . When varus knee with limited subtalar joint motion loses the compensatory function of the subtalar joint, varus deformity of the knee is compensated by valgus alignment of the ankle joint [12, 17, 18]. In this study, 11 of 125 cases (8.8%) showed varus of the ankle joint, which means a TPI (+), TI (+), and TT (-) pattern. 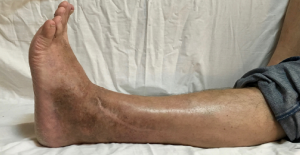 In these cases, subsequent foot/ankle pain or disability may occur after TKA because the subtalar joint may not be able to reorient itself after knee realignment because of rigid hindfoot deformity. Another limitation was that the results were based only on radiologic assessment two weeks after TKA without clinical assessment. It is possible that realignment of the knee joint effects symptoms in the ankle joint after TKA [19-24]. Moreover, the acute change in alignment of the ankle joint, together with the changes in the biomechanics of the ankle joint, changes the contact area of the tibiotalar joint and consequently contributes to increasing pressure on articular cartilage and accelerated degeneration of the ankle joint . When degenerative changes and angular deformities of the knee are severe, a varus deformity is usually three-dimensional and associated with flexion contracture of the knee, and the varus angle measured on radiographs may not be a true varus angle [26, 27]. In conclusion, the change in alignment of the knee joint by TKA for varus knee OA influenced the alignment of the ankle joint immediately after surgery in this study. Examination and assessment are required not only at the knee joint but also at the ankle joint before TKA. More careful follow-up of the ankle after TKA should be considered when TKA is performed in patients with HKA above 16° and the aim should be to keep HKA below 1.3° during the procedure. No benefits in any form have been received or will be received from a commercial party related directly or indirectly to the subject of this article. No funds were obtained in support of this study. Funding declaration: No funds were obtained in support of this study. Conflict of interest declaration: No benefits in any form have been received or will be received from a commercial party related directly or indirectly to the subject of this article. Blazek K, Favre J, Asay J, Erhart-Hledik J, Andriacchi T. Age and obesity alter the relationship between femoral articular cartilage thickness and ambulatory loads in individuals without osteoarthritis. J Orthop Res. 2013;32(3):394–402. Prieto-Alhambra D, Judge A, Javaid MK, Cooper C, Diez-Perez A, Arden NK. Incidence and risk factors for clinically diagnosed knee, hip and hand osteoarthritis: influences of age, gender and osteoarthritis affecting other joints. Ann Rheum Dis. 2014;73(9):1659–64. Harding P, Holland AE, Delany C, Hinman RS. Do activity levels increase after total hip and knee arthroplasty? Clin Orthop Relat Res. 2013;472(5):1502–11. Chen JY, Yeo SJ, Yew AK, Tay DK, Chia SL, Lo NN, et al. The radiological outcomes of patient-specific instrumentation versus conventional total knee arthroplasty. Knee Surg Sports Traumatol Arthrosc. 2014;22(3):630–5. Iacono F, Bruni D, Bignozzi S, Colle F, Marcacci M. Does total knee arthroplasty modify flexion axis of the knee? Knee Surg Sports Traumatol Arthrosc. 2014;22(8):1728–35. Daniilidis K, Tibesku C. Frontal plane alignment after total knee arthroplasty using patient-specific instruments. Int Orthop. 2013;37(1):45–50. Keyes BJ, Markel DC, Meneghini RM. Evaluation of limb alignment, component positioning, and function in primary total knee arthroplasty using a pinless navigation technique compared with conventional methods. J Knee Surg. 2013;26(2):127–32. Thienpont E, Paternostre F, Pietsch M, Hafez M, Howell S. Total knee arthroplasty with patient-specific instruments improves function and restores limb alignment in patients with extra-articular deformity. Knee. 2013;20(6):407–11. Paternostre F, Schwab PE, Thienpont E. The difference between weight-bearing and non-weight-bearing alignment inpatient-specific instrumentation planning. Knee Surg Sports Traumatol Arthrosc 2014;22(3):674–9. Luyckx T, Vanhoorebeeck F, Bellemans J. Should we aim at under correction when doing a total knee arthroplasty? Knee Surg Sports Traumatol Arthrosc 2015;23(6):1706–12. Tallroth K, Harilainen A, Kerttula L, Sayed R. Ankle osteoarthritis is associated with knee osteoarthritis. Conclusions based on mechanical axis radiographs. Arch Orthop Trauma Surg. 2008;128(6):555–60. Lee JH, Jeong BO. 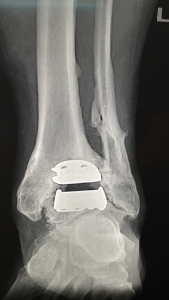 Radiologic changes of ankle joint after total knee arthroplasty. Foot Ankle Int. 2012;33(12):1087–92. Choi W, Yang JH, Park JH, Yun HH, Lee YI, Chae JE, et al. Changes in coronal alignment of the ankle joint after high tibial osteotomy. Knee Surg Sports Traumatol Arthrosc. December 19, 2015. doi: 10.1007/s00167-015-3890-3. 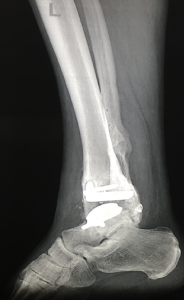 Gursu S, Sofu H, Verdonk P, Sahin V. Effects of total knee arthroplasty on ankle alignment in patients with varus gonarthrosis: Do we sacrifice ankle to the knee? Knee Surg Sports Traumatol Arthrosc. 2016;24(8):2470–5. Chandler JT, Moskal JT. Evaluation of knee and hindfoot alignment before and after total knee arthroplasty: a prospective analysis. J Arthroplasty. 2004;19(2):211–6. Mullaji A, Shetty GM. Persistent hindfoot valgus causes lateral deviation of weightbearing axis after total knee arthroplasty. Clin Orthop Relat Res. 2011;469(4):1154–60. Norton AA, Callaghan JJ, Amendola A, Phisitkul P, Wongsak S, Liu SS, et al. Correlation of knee and hindfoot deformities in advanced knee OA: compensatory hindfoot alignment and where it occurs. Clin Orthop Relat Res. 2015;473(1):166–74. Takenaka T, Ikoma K, Ohashi S, Arai Y, Hara Y, Ueshima K, et al. Hindfoot alignment at one year after total knee arthroplasty. Knee Surg Sports Traumatol Arthrosc. 2016;24(8):2442–6. Tetsworth K, Paley D. Malalignment and degenerative arthropathy. Orthop Clin North Am. 1994;25(3):367–77. Cooke TD, Harrison L, Khan B, Scudamore A, Chaudhary MA. Analysis of limb alignment in the pathogenesis of osteoarthritis: a comparison of Saudi Arabian and Canadian cases. Rheumatol Int. 2002;22(4):160–4. Guichet JM, Javed A, Russell J, Saleh M. Effect of the foot on the mechanical alignment of the lower limbs. Clin Orthop Relat Res. 2003;415:193–201. Desmé D, Galand-Desmé S, Besse JL, Henner J, Moyen B, Lerat JL. [Axial lower limb alignment and knee geometry in patients with osteoarthritis of the knee]. Rev Chir Orthop Reparatrice Appar Mot. 2006;92(7):673–9. French. Mizuuchi H, Matsuda S, Miura H, Higaki H, Okazaki K, Iwamoto Y. 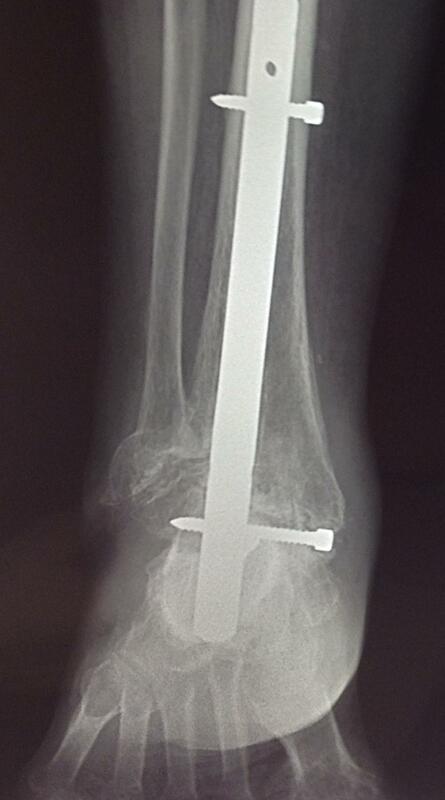 The effect of ankle rotation on cutting of the tibia in total knee arthroplasty. J Bone Joint Surg Am. 2006;88(12):2632–6. Gao F, Ma J, Sun W, Guo W, Li Z, Wang W. The influence of knee malalignment on the ankle alignment in varus and valgus gonarthrosis based on radiographic measurement. Eur J Radiol. 2016;85(1):228–32. Tarr RR, Resnick CT, Wagner KS, Sarmiento A. Changes in tibiotalar joint contact areas following experimentally induced tibial angular deformities. Clin Orthop Relat Res. 1985;199:72–80. Cooke D, Scudamore A, Li J, Wyss U, Bryant T, Costigan P. Axial lower-limb alignment: comparison of knee geometry in normal volunteers and osteoarthritis patients. Osteoarthritis Cartilage. 1997;5(1):39–47. Hunt MA, Fowler PJ, Birmingham TB, Jenkyn TR, Giffin JR. Foot rotational effects on radiographic measures of lower limb alignment. Can J Surg. 2006;49(6):401–6.